This product was changed from ascites to tissue culture supernatant on 4th April 2019. Please note that the dilutions may need to be adjusted accordingly. If you have any questions, please do not hesitate to contact our scientific support team. Our Abpromise guarantee covers the use of ab47171 in the following tested applications. 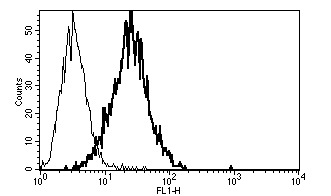 A typical staining pattern with ab47171 monoclonal antibody of KG-1 cell line. 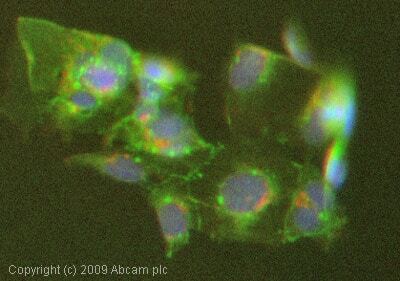 ICC/IF image of ab47171 stained Hek293 cells. The cells were 4% PFA fixed (10 min) and then incubated in 1%BSA / 10% normal goat serum / 0.3M glycine in 0.1% PBS-Tween for 1h to permeabilise the cells and block non-specific protein-protein interactions. The cells were then incubated with the antibody (ab47171, 1µg/ml) overnight at +4°C. The secondary antibody (green) was Alexa Fluor® 488 goat anti-mouse IgG (H+L) used at a 1/1000 dilution for 1h. Alexa Fluor® 594 WGA was used to label plasma membranes (red) at a 1/200 dilution for 1h. DAPI was used to stain the cell nuclei (blue) at a concentration of 1.43µM. Publishing research using ab47171? Please let us know so that we can cite the reference in this datasheet. There are currently no Customer reviews or Questions for ab47171.